Girl Scouts of Utah recently held its annual Recognition of Excellence ceremony. A number of Scouts from Tooele County were honored. Pictured above, from left to right, are: (Back Row) Kim Maughan, Kyra Chambers, Dakota Herzog, Memphis Niles, Kaylyn Ashby, Nikki Bunnow, Ashley Rose and Cheri Gunderson; (Front Row) Erryn Shoemaker, Cheyenne Greene, Bella Mohel, Alaura Chance, Madelyn Pearce, Hannah Cowan and Taryn Mori. Not pictured are Aspen Bertot, Hope Warby, Amy Putnam, Casey Putnam and Ekaterin Darling. Fourteen members of Tooele Girl Scout Troop 2339 participated in the flag ceremony at the Recognition of Excellence awards ceremony. Pictured above, from left to right, are: (Back Row) Erryn Shuemaker, Ekaterin Darling, Lynzie Fox, Casey Putnam, Kyra Chambers, Amy Putnam, Alaura Chance, Anastasia Roberson and Mercedes Sweeney; (Front Row) Veronica Fox, Saige Fox, Lillian Dillion, Topanga Reed, Sabrina Shoemaker and Riley Fox. Girl Scouts of Utah recently held its annual Recognition of Excellence. This event honored girls and adults and acknowledged their achievements and service to their communities. These are the highest awards available to earn for girls and adults. Junior Girl Scouts in fourth and fifth grades can earn the Bronze Award. For this award, each girl must participate in a project that benefits the girl’s community, school, city or town. The girls can work individually or in a group. Each girl should be involved in the project a minimum of 20 hours. Cadette Girl Scouts in sixth through eight grades can earn the Silver Award. For this award, each girl works on a project individually, with a partner or as part of a small group. The project involves approximately 50 hours and will help make a difference in the world around them. 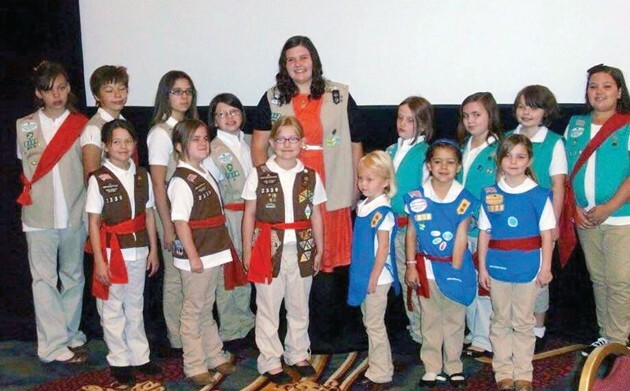 Four Tooele Girl Scout Troops had girls honored this year. In Troop 62, Ashley Rose and Aspen Bertot earned their Silver Award. In Troop 146, Taryn Mori, Madelyn Pearce, Hope Warby, and Hannah Cowan earned their Bronze Award. In Troop 236, Bella Mohel and Cheyenne Green earned their Bronze Award, and Dakota Herzon, Memphis Niles, Nikki Bunnow and Kaylyn Ashby earned their Silver Award. In Troop 2339, Amy Putnam, Casey Putnam, Alaura Chance, Erryn Shuemaker and Ekaterin Darling earned their Bronze Award. Two local leaders were also honored. Cheri Gunderson, leader of Troop 1123 and member of the Tooele Community Leadership Team, was given the Volunteer of Excellence Pin. This award recognizes volunteers who have contributed outstanding service to the council through program delivery to girls and adult members and whose performance has been beyond the expectations of the position requirements. Kim Maughan, leader of Troop 642 and member of the Tooele Community Leadership Team, was given the Freddie Award. This recognizes volunteers who have delivered outstanding service to the council as well as made significant contributions to other community organizations. Additionally, Kyra Chambers from Troop 642 was part of the girl planning team and participated in several aspects of the meeting. She introduced guests, and honorees and had several speaking roles. Troop 2339 had 14 members participate as they opened the event with the flag ceremony. Girl Scouts build girls of courage, confidence, character and make the world a better place. 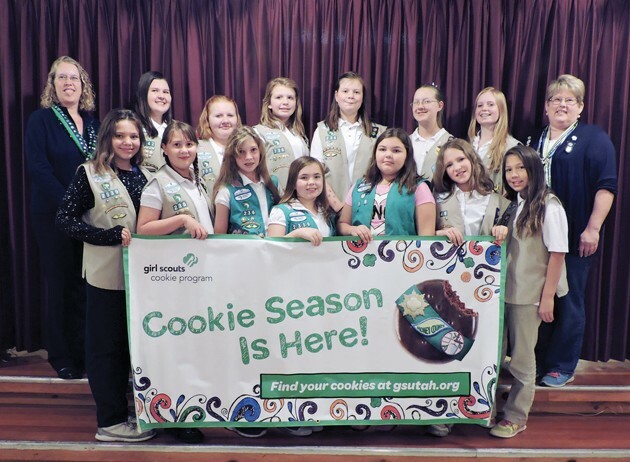 If you would like to know more about the opportunities in Girl Scouts, please contact Cheri Gunderson at (801) 634-2070 or at tooelegirlscouts on Facebook.